Here is something I must tell you…I love vegetables. I know, big confession from a vegetarian, right? But there is no rule that says you must love vegetables if you are a vegetarian. After all, cheese is vegetarian – as is bread, pasta, chocolate, french fries…you get the picture. But I am a card carrying member of the vegetarians-who-love-vegetables club. The only one I don’t like is okra. Once in a while, I want to make something really heavy on the veg. Summer time is when it usually hits me. I’m in the mood for something flavorful, but don’t want anything too heavy. It just doesn’t feel right to eat a big dish of something rich when the sun is shining, the temperatures are soaring, and it’s light until 10. On of those days, vegetables are where it’s at. This recipe comes from one of my all-time favorite cookbooks, Vegetarian Suppers from Deborah Madison’s Kitchen. It is a slim and modest volume, but there are incredible treasure inside. I’ve used this book so much that some of the pages have torn away from the spine. I made this dish a few years ago, made some notes in my book about changes I made, and was glad to have those notes last night. At first glance, this may seem like an overly fussy recipe. Lots of chopping and cooking things separately. I actually streamlined a few things from the original and the recipe below reflects that. Please trust Ms. Madison and trust me – any fuss is worth it. What you will get is a perfectly cooked and perfectly seasoned bowl of seasonal and healthy goodness. Oh…and that gorgeous Olive Bread off to the side in the photo? You can find the recipe here. 2. To make the ragout, slice the leaves off the chard stems, wash well, then cut into ribbons about an inch wide. Trim the ends of the stems, then thinly slice. Heat a large skillet over medium heat. Add about 2 tbsp. olive oil, then the stems with a pinch of salt. Sauté, stirring occasionally, for 4 minutes. Lay the leaves on top (it may seem crowded at first) and continue stirring until the leaves wilt, about 4 more minutes. Scrape out the pan into a large bowl and set aside. 3. Return the same pan to the heat. Add another few tablespoons of olive oil, then add the mushrooms. Sauté until the mushrooms have browned nicely, then released and partially reabsorbed their juices, about 8 minutes. Season to taste with salt and pepper and add to the bowl with the chard. 4. Return the same pan to the heat. Add another few tablespoons of olive oil. Add the onion and carrots. Cook over medium-high heat for a few minutes just to brown things a bit, then reduce the heat to medium. Add the wine, let most of it sizzle away, then add 1 cup water and the asparagus. Season with a pinch of salt, then lower the heat even more, cover, and cook until the asparagus and carrots are nearly tender, about 6 minutes. Add the snap and English peas, cover, cook for another 3 minutes. Add the tortellini, mushrooms, and chard. Stir to heat through. 5. Carefully stir in the beurre blanc and the herbs. Serve the ragout in shallow bowls, garnished with a dusting of Parmesan cheese. 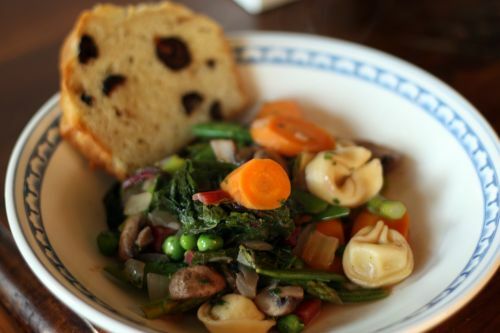 That’s such a colorful bowl of vegetables, I wish I could pick it off the screen. The ragout sounds fantastic, and I want a piece of that olive bread too. I’m like you–a supreme lover of vegetables (even–and especially–okra!). And I do mean LOVE! This dish looks sooo wonderful. Your dishes always do. Yum! Can’t wait to try it. Love to find recipes that dear hubby will love, and this looks like one for sure. The boys adore tortellini, so should make everyone happy. Thanks for posting! I can eat vegetables for lunch & dinner every day. I’m always looking for good recipe. This one sounds yummy. oh, i’m so bad with vegetables… with each visit to the market i like them more and more though. Oh, the idea is really nice. 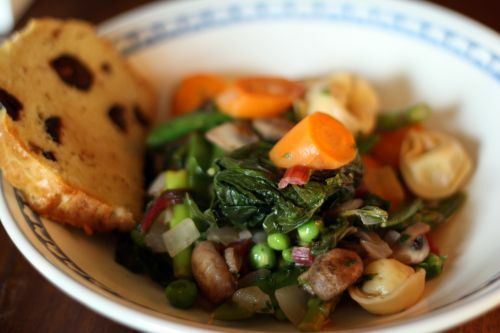 And you manage to take a really nice photo of this veggie stir, it’s really not easy to make them look good! You did it. That sounds like the perfect comfort dish, and it looks lovely!